"Nobody, but nobody, can claim a singular credit for the generous act of the Americans," Mr Duterte told a jubilant crowd on Saturday. "The credit goes to the American people and to the Filipino people, period." The president had called for their return in a 2017 speech, in which he also suggested building closer ties with China. The bells are viewed as a symbol of Philippine independence against their former colonial masters. Following the Balangiga massacre of 1901, when Filipino militants ambushed and killed 48 US troops, US General Jacob H Smith ordered the area be turned into a "howling wilderness". US troops seized the three bronze bells as war trophies during the bloody reprisals. Thousands of Filipinos are thought to have been killed. Despite calls for their return for decades, US veterans and politicians said the bells were tributes to the killed US troops and refused to consider their repatriation. One of the bells was with the US 9th Infantry Regiment in Korea and the other two were at a former 11th Infantry Regiment base in Wyoming. 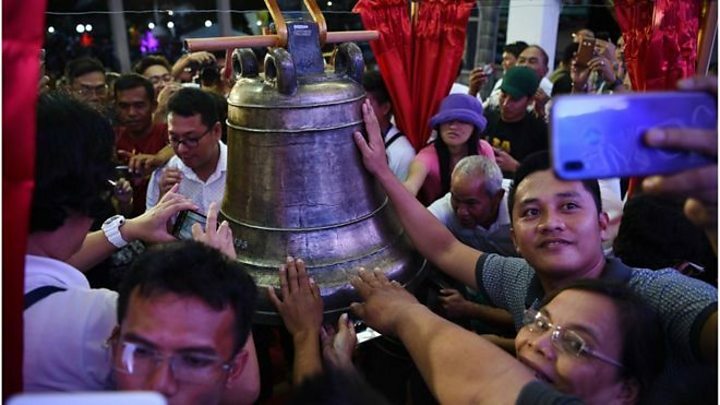 But after continued Filipino pressure and waning opposition in the US, the bells were flown to Manila earlier this week for Saturday's ceremony in Balangiga. "We are the happiest people on Earth now," 81-year-old Nemesio Duran told AFP news agency. "The whole town is walking in the clouds because the bells are finally with us." However, for some the return struck a more sombre note. Constancia Eleba told AFP the bells gave her "mixed emotions" given the history surrounding them. "It was painful and you cannot take it away from us," she said. "We can never forget that."